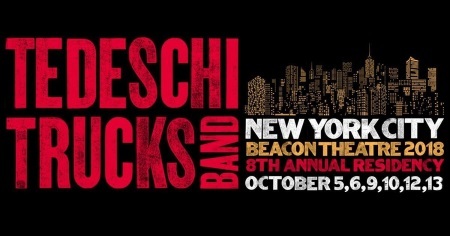 Roots rockers the Tedeschi Trucks Band have announced their 8th annual residency @ New York City’s Beacon Theatre. They wil perfrom on October 5, 6, 9, 10, 12 and 13. Extra dates are highly likely. Last year they were joined by a wealth of guest musicians sitting in, including Trey Anastasio, Nels Cline, John Medeski, The Wood Brothers, and Marcus King.